The Ayaidah, a Bedouin tribe in north-eastern Egypt is the last to practice the Bisha’h, an ancient ritual used to determine whether a suspect in a crime is innocent or guilty. 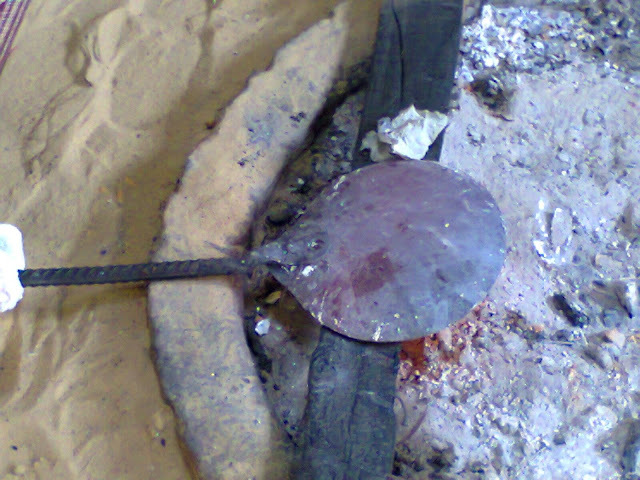 They have to lick a red-hot spoon or rod in the presence of tribal authorities, and if their tongue blisters, they are guilty, if it’s left unscathed, they are innocent. Believed to date back to ancient Mesopotamia, Bisha’h was used by most Bedouin tribes throughout the centuries, but all except the Ayaidah eventually abandoned it. The ritual is banned in countries like Jordan and Saudi Arabia, but not in Egypt, although religious groups in the African country view it as unislamic. Considered by many the world’s oldest lie detection system (but definitely not the most accurate), Bisha’h was mostly used in situations where a crime was committed, but there were no witnesses. Suspects had to lick a heated spoon to prove their innocence, and regardless of the result, the verdict could not be contested. The principle behind Bisha’h is that a lying person is nervous and has a dry mouth, so their tongue will be burned by the hot metal. If they are innocent, they are relaxed, so the saliva on the tongue will protect it against the red-hot metal. However, opponents of the ritual have claimed that that is not always the case, and that the ritual not only causes physical harm to suspects, but also often leads to their condemnation, even though they are in fact innocent. Today, the Bisha’h is used as a last resort, when parties cannot come to an agreement, or when there is no other proof or witnesses available. It’s also used as a way of scaring suspects into confessing their crimes, and bringing unsolved disputes to a close. For example, if the plaintiff accepts compensation from the subjects before the ritual is carried out, there is no need to move on with the Bisha’h. That is considered another weakness of this lie detection system, as some people will accept the blame if it means not having to lick hot metal to prove their innocence. Bisha’h is usually a very public affair, with both parties arriving with great fanfare, accompanied by witness. The ritual itself is conducted by a tribe official known as a Mubesha. If a suspect chooses not to show up for Bisha’h, or refuses to lick the hot metl spoon, he is automatically considered guilty. As you can imagine, undergoing Bisha’h can result in some nasty tongue burns, but the Ayaidah tribe continue to rely on it in order to resolve legal matters within the tribe. If or when they decide to stop using the ancient lie detection method, the ritual will die off completely.